This is the kinda soup that you can eat all year round. 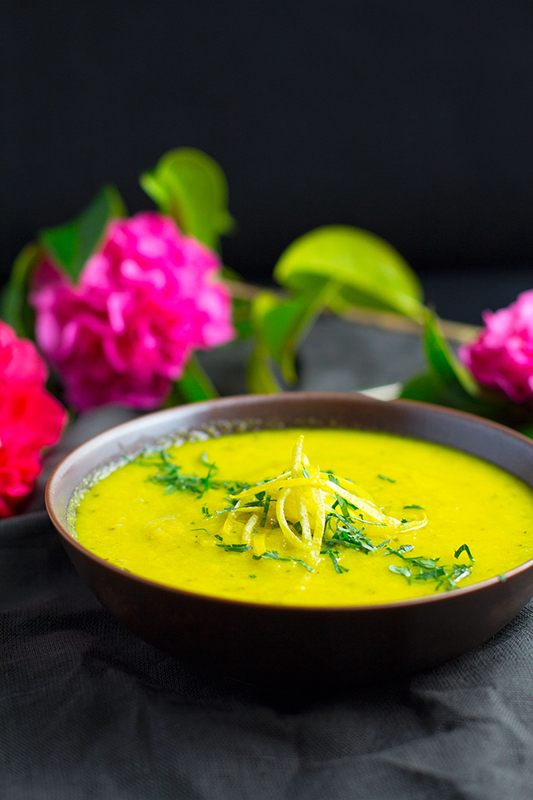 With its light and zesty flavours, this healthy Cauliflower and Zucchini Soup will definitely satisfy anyone’s taste buds. Just like LASTS WEEKS POST, this delicious soup was actually shot a couple of months ago. Right before I started posting all my Christmassy and festive styled posts, which kinda took over. And this little guy, well he got left to hang out and wait till he would be shared with the world. But today is his day, and I promise you guys will be so happy that his day finally arrived. I feel a bit weird about sharing a soup when we are in the middle of our summer down here in NZ, but to be quite honest this soup is seriously too good, I couldn’t possibly hang on to it till next winter before I shared it. Plus I think it’s the kinda soup that can be eaten anytime of the year due to its light, fresh and zesty flavours. And we are smack bam in the middle of zucchini season so I think I can get away with posting it, being seasonally and all that. It’s so simple and easy to make. It only requires 7 ingredients + seasoning. It’s incredibly healthy and nourishing, filled with lots of outstanding ingredients. It’s dairy free, gluten-free and nut free. And it is exploding with fantastic flavours. 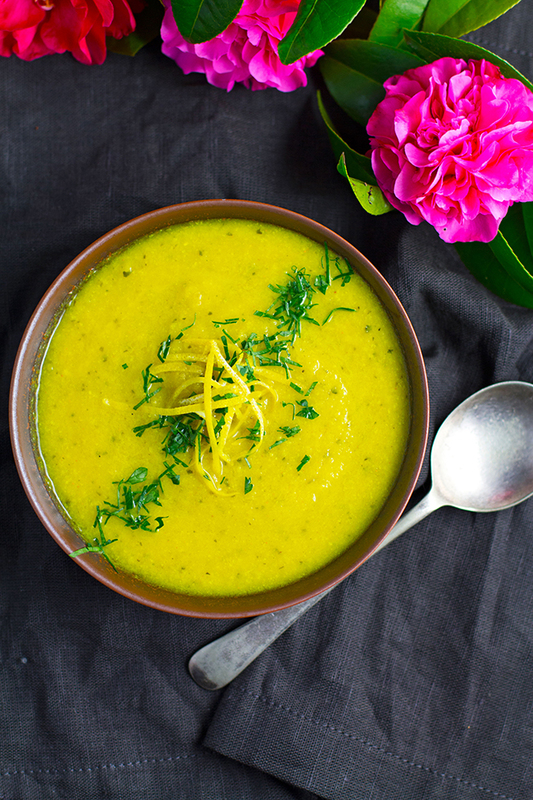 You guys are going to love the amazing flavours that this Cauliflower and Zucchini Soup has to offer. 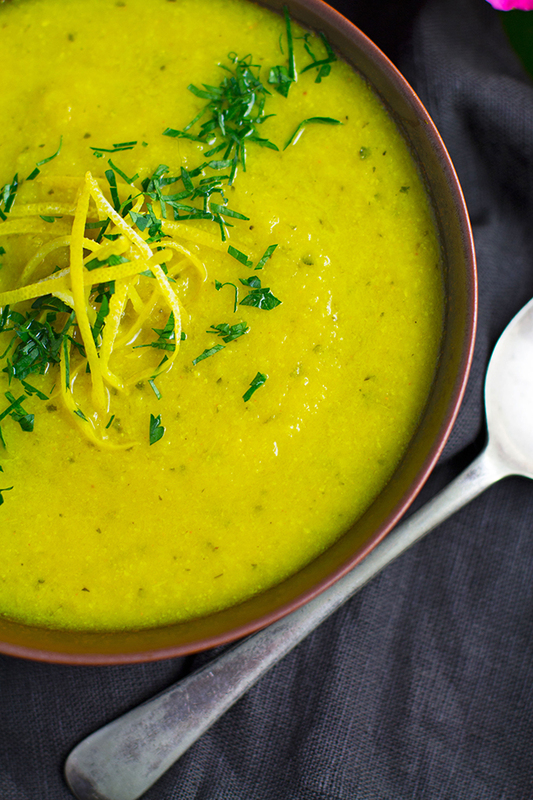 The addition of fresh lemon juice gives a lovely fresh and zesty flavour to the soup. And the ground turmeric gives it a stunning yellow flavour that is incredibly eye-catching. Then the stars of the show the cauliflower and zucchini, well the just treat each other so well. Combining together to create a magical soup base that works perfectly with its additions. Don’t let the lightness of this dish fool you into thinking that it will not be satisfying enough on its own. Cause it sure is!!! But like most soups a couple of slices of toasted bread served on the side would not go astray. I hope you guys love this soup as much as I do. And don’t forget to let me know how you go with it by leaving a comment below. I love it when we share our cooking adventures together. Heat the vegetable oil in a medium or large saucepan or pot over a medium to high heat. Add the garlic and onion and sauté until soft. Add the zucchini and cauliflower, reduce to a medium heat and continue to cook whilst stirring gently for 8-10 minutes. Add the vegetable stock and turmeric, bring to the boil and then simmer until the cauliflower is tender. Remove from the heat and blend either with an immersion blender or in the food processor. Stir in the lemon juice and season to taste with salt and pepper. HI! I just discovered your blog while looking for an easy roasted chicken breast recipe. I found this Cauliflower and Zucchini Soup which sounds just right for the middle of our New Jersey winter. However, I have a question – what is numeric powder? I have never heard of that spice. Thanks! And I am looking forward to following your blog! Hi Vicky, thanks so much for spotting my typo. It is meant to be turmeric powder not numeric powder. I hope you enjoy the soup and I would love to hear how you go with it. Apart from not adding the lemon juice & the salt & pepper,I followed this recipe exactly. I air fried my zucchini though so my version of the soup came out significantly darker.Delicious though.I’m going to make this soup again next week & add the lemon & salt/pepper next time.